The King Sisters were born and raised in Pleasant Grove, Utah, about 35 miles south of Salt Lake City. For fourteen years, their father, William King Driggs Sr. (known as King), was a professor of music and a voice teacher at several colleges in Colorado and Utah. 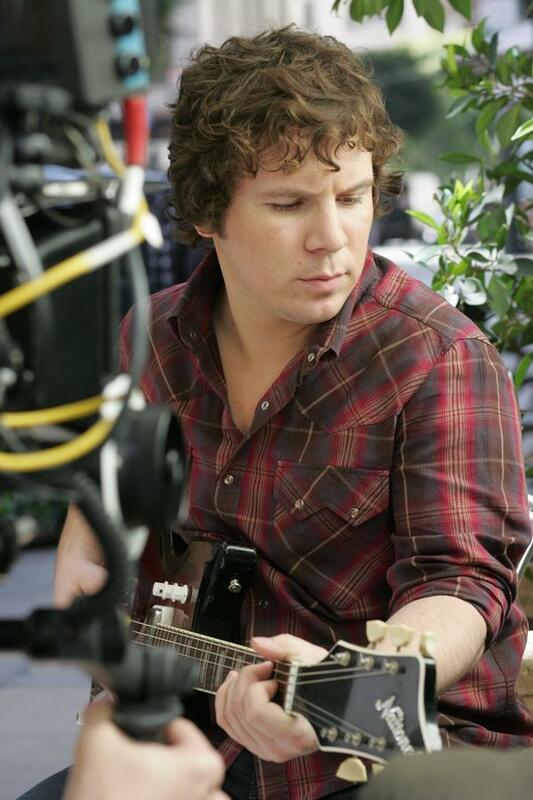 He was also the first music teacher for his progeny, as he taught them how to play various instruments. As the size of the family increased, the ability to support a family on a teacher’s income became more of a challenge, and so, while the girls were still youth, the family supplemented their meager income by performing as a family orchestra (known at that time as “The Driggs Family of Entertainers”), traveling throughout the West, during the summers and on weekends, performing in theatres, clubs, schools, and churches. The family continued to grow and eventually there were six girls and two boys (Karleton, Maxine, Luise, Alyce, Donna, Yvonne, Bill and Marilyn), creating even more financial hardship for the family. Several times they awoke to find that their car had been repossessed. Eventually the family moved to Oakland, California, where making a living as a music teacher was more feasible and attainable. The girls made their broadcast debut on Oakland radio station KLX in 1931. As it was the depression era, eking out a living as a music teacher became insubstantial, and the scanty income that the sisters earned from their radio show, a mere $25 per week (collectively), became the sole means for supporting the family. Performing three times a week, with their brother Karleton as their piano accompanist, the girls came up with their own arrangements themselves, using the training they’d gotten from their father. Like most singing sisters, the Driggs Sisters idolized the successful Boswell Sisters and tried to emulate their heroines by learning their songs and arrangements. The girls would rush home from school and faithfully tune in KFWB from Los Angeles to hear the Boswells sing their trend-setting harmonies. In 1934, bandleader Horace Heidt, after hearing one of the King Sisters’ broadcasts on KSL, convinced their parents to let them go to San Francisco to be a part of his orchestra as special guests for a two-week engagement at the Golden Gate Theater. Although the girls were excited to have been offered such a fortuitous opportunity, the pace that they were expected to maintain soon became overwhelming. They performed four or five shows a day, seven days a week. The original two-week stint, lasted for five years. The group then became a quartet when Maxine married and retired, and sisters, Donna and Yvonne, joined the group. Later Donna retired and was replaced by baby sister Marilyn. At one time or another every one of the six Driggs daughters sang as a member of The King Sisters. First recording and performing with the Horace Heidt Orchestra across the country including Chicago’s Drake Hotel and New York’s Biltmore Hotel, The King Sisters later toured with legendary bandleader and clarinetist Artie Shaw before joining guitarist and fellow Heidt –alum Alvino Rey (married to King Sister Luise) and his orchestra. Together they became one of the leading attractions of the day on records, radio and the concert stage. It wasn’t long before Hollywood began to take notice of The King Sisters’ talents and they began to appear in such films as “Cuban Pete” with Desi Arnaz, “Meet the People” with Lucille Ball, and MGM’s “Thrill of Romance” with Van Johnson and Esther Williams. By 1953, NBC had offered the King Sisters and Alvino Rey their own television series, The Alvino Rey – King Sisters Show, which was a huge success with the audiences in Los Angeles, and gained the attention of Capital Records. By this time Donna had retired from the group, and Marilyn became a permanent part of The King Sisters. Signed to Capitol Records in 1957, The King Sisters debuted a brand new sophisticated sound, lowering the keys of their songs, featuring more unisons and developing a far more jazz oriented feel to their performances of always first rate material. 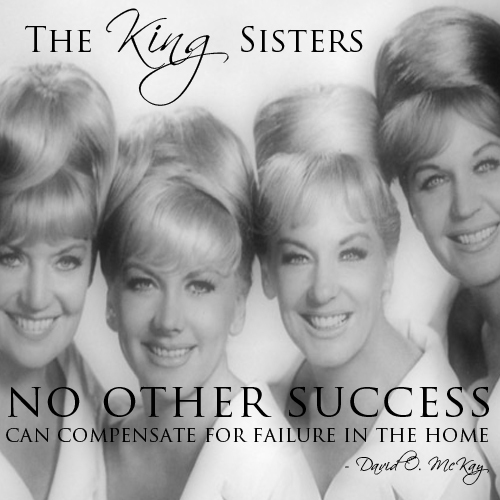 Great public and critical success followed each new King Sisters record including a Grammy nomination for their groundbreaking Imagination album. Their recording success led to a busy schedule of concert dates in the nation’s top clubs and showrooms as well as appearances on television showcases including The Steve Allen Show, The George Gobel Show and The Adventures of Ozzie & Harriet. Having been asked to put together a benefit show for her church (The Church of Jesus Christ of Latter-day Saints), Yvonne decided to invite her entire family to join her on stage. The show was a success, and soon each sister’s church began asking for the same type of show. One such show was performed at Brigham Young University and taped by the student video department. 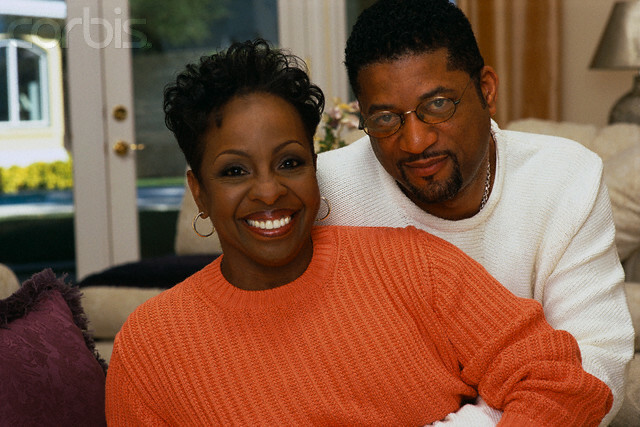 Yvonne sent an edited version of the tape to ABC television to be considered as a possible television series, and The King Family was born. Following two appearances on The Hollywood Palace, The King Family headlined their own first special. Public response to that initial TV outing was ecstatic with the network receiving over 53,000 letters of fan support for the newly crowned TV sensations. The special’s success spawned two separate King Family variety series and seventeen King Family specials throughout the 1960’s and 70’s. The King Family continued to appear together in concert and on television throughout the 1970’s and The King Sisters continued into the 1980’s. They were one of the featured entertainers at Ronald Reagan’s second Presidential Inauguration Gala in 1985. 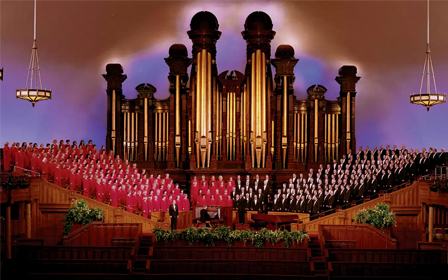 Most recently The Family performed together in 1996 for Utah State’s sesquicentennial celebration. In 2004, their unique place among the pantheon of entertainers associated with the holidays, including Andy Williams and Judy Garland, was celebrated as part of the BRAVO Television Network’s documentary The Christmas Special Christmas Special. Alyce King Clarke died on 23 August 1996 from respiratory problems at the age of 81. Luise King Rey died on 4 August 1997, the year of her 60th wedding anniversary to Alvino Rey at the age of 83 from cancer. Donna King Conkling died on 16 June 2007, aged 88, in Plano, Texas. Maxine King Thomas died on 13 May 2009, aged 97 in Corona, California. Yvonne King Burch died on 13 December 2009 after suffering a fall at her home in Santa Barbara, California at the age of 89. Marilyn King, the last surviving sister, died on 7 August 2013 at the age of 82, from cancer in California. The Sisters may no longer be with us, but their music and the legacy that they left behind will have lasting memories for many generations to come. It is no small wonder that The King Family was originally christened “America’s First Family of Song” in the 1960’s, as they created beautiful harmony together, not only as The King Sisters, but especially as The King Family. 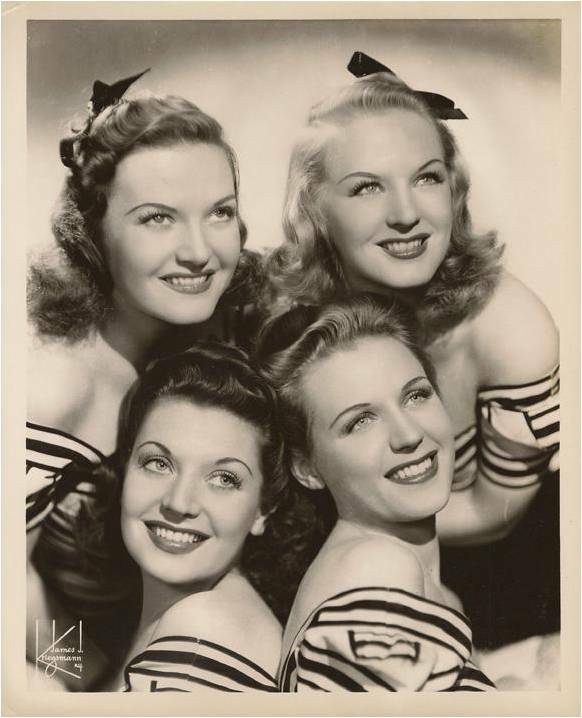 One of the big band era’s most popular and enduring vocal groups, the King Sisters — Donna, Yvonne, Luise and Alyce — were born and raised in Salt Lake City, UT. Taking their stage name from their father, vocal trainer Daddy King Driggs. The King Family had several incarnations up through the early 70’s. The show was renewed for the 1966-67 season, and made a brief comeback as a regular series in the Spring of 1969. They also did several guest appearances on Ed Sullivan and Hollywood Palace. In 1967, they began producing a series of holiday specials, beginning with Thanksgiving and Christmas. By 1971, they ended up with a special for every month of the year (there was a joke about “Groundhog Day with the King Family”), many of which were repeatedly aired in syndication for years after. So is it safe to use the madden mobile cheat?